The agency has updated its pesticide protections for the first time in nearly 25 years. Will the people behind our food be any safer? For the first time since 1992, the U.S. Environmental Protection Agency (EPA) has updated the pesticide protections it requires for the more than two million people who plant and harvest our food. The new protections, which will go into effect in early 2017, could be a game-changer for American farms and workers. Pesticides can cause a wide range of adverse health effects, including skin rashes, nausea, and headaches, birth defects, reproductive disorders, and increased risk for certain types of cancer, and learning and behavior problems for children whose mothers were exposed while pregnant. Nonetheless, U.S. farms use over 900 million pounds of pesticides [PDF] each year. The EPA estimates that approximately 10,000 to 20,000 farmworkers are diagnosed with pesticide poisoning and between 1,800 and 3,000 occupational pesticide exposure “incidents” are also reported every year. * Ensuring that fewer people are exposed to these farm chemicals could make agricultural work much safer. 1. The New Rules Will Protect Young People. The rules will set a minimum age of 18 for workers handling pesticides. “This is particularly important,” Migrant Clinicians Network director of occupational and environmental health Amy Liebman told Civil Eats. While young children are particularly vulnerable, new research suggests that teens are also sensitive to pesticide exposure. Until now there was been no age limit, and children as young as 12 can legally work on farms, as long as they’re with their parents. Now, those under 18 will also be barred from entering areas treated by pesticides for 48 hours (4 hours for greenhouses). This age limit, however, does not apply to a farm owner’s family members. 2. Farms Must Provide More Training and Information. Under the new rules, workers will have to be trained annually rather than once every five years as under the old rules, and before they work where pesticides have been used in the past 30 days. Previously, “a worker could begin work without being trained. That’s very important,” says Liebman. Training will also be expanded “to include how to reduce taking home contamination,” explained EPA Administrator Gina McCarthy, on a recent press call. And information about pesticide hazards will have to be posted in a central workplace location in both Spanish and English. 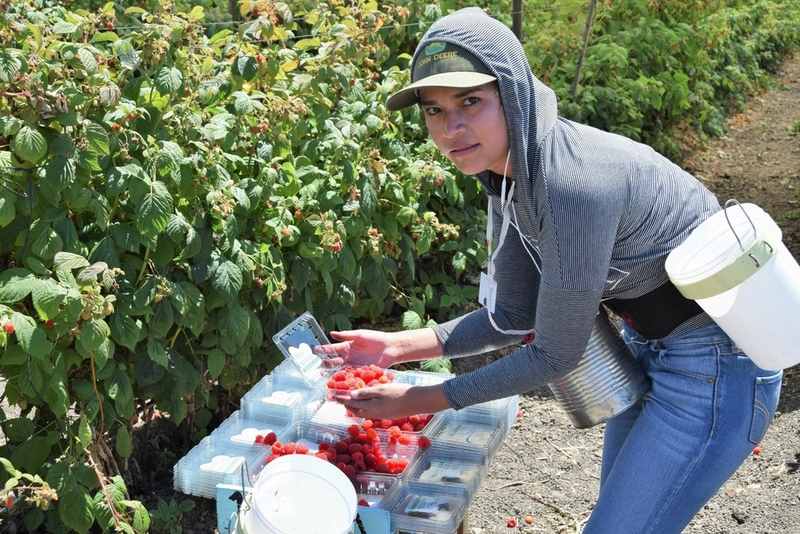 Employers will also be required to keep specific records of pesticides applied along with farm worker training information for two years, making it easier to better track any violations and help enforce compliance with these rules. 3. Farms Have to Provide More and Better Gear. Farms will now also have to provide all their workers with personal protective equipment comparable to what the Department of Labor and Occupational Safety and Health Administration (OSHA) require in other in other industries. For example, respirators will have to fit properly and be used effectively. Employers will also now have to provide specific amounts of water on site to ensure workers can wash up properly after handling pesticides and for emergency decontamination. 4. Whistleblowers Will Be Protected. 5. Farmworker Advocates are Applauding the Change. The announcement was greeted with enthusiasm by farmworkers and by farmworker and environmental advocates. Rodriguez called it “a dream come true.” Farmworker Justice director of occupational and environmental health, Virginia Ruiz called the improvements “vital.” And Earthjustice senior legislative representative Andrea Delgado told Civil Eats, “We’re glad the EPA finally took steps to close the historical inequity” between farmworkers and other workers. “The same rules that have protected other American workers from dangerous cancer- and birth-defect causing pesticides are finally going to protect farm workers under the new EPA regulations,” said UFW’s Rodriguez. “I can’t stress how important this is to real lives and real people every day,” said Farmworker Association of Florida pesticide safety and environmental health project coordinator Jeannie Economos. 6. Despite the Change, There are Still Critics on Both Sides. And while most farmworker advocates say the new rules are a big step forward generally, some, including Earthjustice, had hoped for even stronger restrictions on reentering pesticide-treated areas. Some advocates had also asked EPA to require on-site showers for decontamination but EPA did not include that in the new rules. “The bottom line is, in other industries, these [showers] are available,” Liebman told Civil Eats. Another measure that farmworker advocates had hoped for was ongoing medical monitoring. According to Liebman, the EPA explained that there were enough protective measures in the new rule and that medical monitoring would be too expensive for the results it would yield. Ongoing medical monitoring of workers exposed to hazardous chemicals “is a well practiced public health” measure, Liebman says. It can identify “subclinical” exposure levels—before symptoms become problematic—and prevent people from becoming overexposed. This rule also comes at a time when many widely used pesticides are coming under increased scrutiny for their health effects. Earlier this year, the World Health Organization classified glyphosate as a probable carcinogen and California has now proposed adding glyphosate, along with three other pesticides, including malathion, to its list of state-designated carcinogens. *These numbers don’t include many unreported illnesses, nor the children and other family members exposed indirectly. Addressing the further costs for the average farmer I say if you can't afford the heat you need to close down the kitchen, it's called the cost of doing business and yes just like anything, rent, mortgage, taxes it goes up in cost!